If you're spending time in India in March, the states of Goa, Rajasthan and Kerala are where you should head to catch most of the action. Holi, one of the most popular festivals in India, is celebrated in March too. Here's the pick of the best March festivals in India, listed in order of their 2019 dates. The fourth edition of the Kochi-Muzhiris Biennale takes place this year. This festival is the biggest exhibition and contemporary arts festival in Asia. The exhibitions encompass all kinds of mediums and are held in various galleries, heritage buildings and public spaces. There's also an extensive program of talks, seminars, screenings, music, workshops and educational activities for students. When: Ongoing until March 29, 2019. The International Yoga Festival is a must for anyone interested in yoga! With more than 400 people from over 30 countries, it's grown to become one of the largest yoga gatherings in the world. 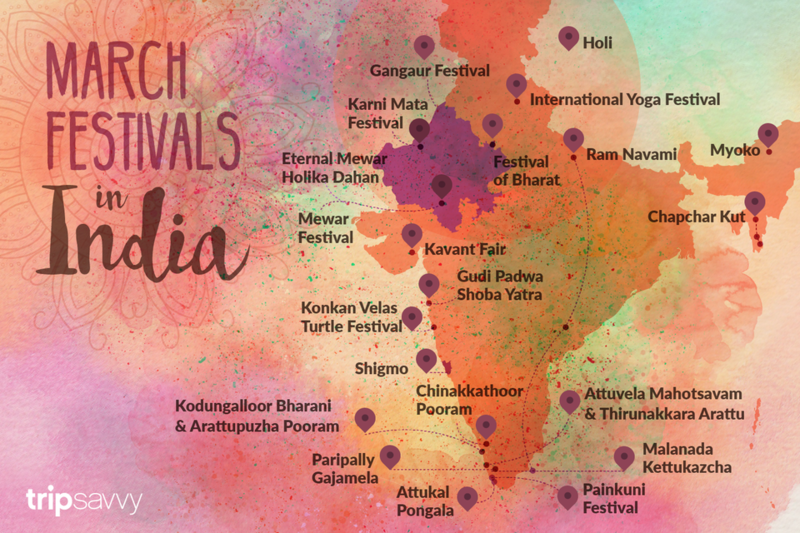 The festival offers yoga classes from world-class Yoga teachers, evening discussions with some of India's leading spiritual leaders, and other events including vegetarian cooking classes and the Yoga Aid Challenge charity fundraiser. More information and a detailed festival program is available on the website. Where: Parmarth Niketan Ashram, Rishikesh, Uttarakhand. Chapchar Kut is a harvest festival named after bamboo that has been cut, and is drying for burning and subsequent cultivation. The traditional bamboo dance performed by women (while men sit on the ground and beat bamboo sticks against each other), called cheraw, is a big part of the festival. Different styles of tribal dance performances take place amidst symbol clashes and beats of drums. There's art, handicrafts, concerts, flower shows, and food as well. When: First week of March each year. Where: Aizawl, the capital of Mizoram in northeast India. Also in Lunglei and Saiha. The colorful Goa Carnival, which began as a local feast by the Portuguese in the 18th century, has developed into the state's most famous event. During the festival, the streets come alive with parades, floats, music, and masked dances. It culminates with the Red and Black Dance, a formal ball in Panaji, where the dress code is red and black. The festivities kick off with a Food and Culture Festival in Panaji. When: Before Lent each year. March 2-5, 2019. Where: The carnival moves from city to city (Panaji, Margao, Vasco and Mapusa) in Goa. The parade starts out from Panaji. Maha Shivratri, the Great Night of Shiva, is when Lord Shiva is believed to have performed his cosmic Tandava dance -- the source of the cycle of creation, preservation, and destruction. Devotees worship Lord Shiva on this occasion to gain release from this cycle of death and rebirth. Most of the festivities take place throughout the night when vigils are maintained at Shiva temples. Devotees fast from sunrise, swim in the holy Ganges river, offer prayers at the temples, and chant devotional songs. Many people also consume bhang, a substance derived from cannabis. There's a street procession in Varanasi. Where: Shiva temples all over India. One of India's most unusual festivals, the Angalamman Festival sees tens of thousands of devotees dressing themselves up to worship the Goddess Angalamman, a reincarnation of Goddess Pavarti (the wife of Lord Shiva). The goddess is considered to be extremely fierce and must be appeased with blood. Some devotees go to the extreme of piercing lemons all over their torsos to please her. When: The day after Maha Shivratri, March 5, 2019. Where: Kaveripattinam, Krishnagiri district of Tamil Nadu, approximately two hours southeast of Bangalore in Karnataka. The nearest railway station is Krishnagiri City Junction, about 15 minutes away. An initiative of Rajasthan Tourism, the Jaipur International Jazz and Blues Festival will showcase bands from various countries including India. It aims to open up the world of jazz and blues, and the different genres, to wider audiences. Where: Central Park in Jaipur, Rajasthan. A visual and cultural spectacular, the highlight of the Chettikulangara Bharani temple festival is a stunning event called Kettukazhcha, featuring a procession of brightly decorated structures. The festival is dedicated to Goddess Bhagavathy. Where: Chettikulangara temple, Mavelikara, Alleppey district, Kerala. This 10-day festival, celebrated by the royal family of Travencore (a former princely state in south Kerala), sees towering fiberglass statues of the Pandavas (the five sons of Pandu in the Hindu epic the Mahabharata) placed at the eastern entrance to the temple to please the Rain God, Indra. On the last day, the male members of the royal family take the idols in procession to be immersed at Sanghumugham beach. Where: Sree Padmanabha Swamy Temple, Trivandrum, Kerala. Patayani is a type of ancient ritual folk art form that is performed to appease goddesses at Bhadrakali temples in central Kerala. It features traditional percussionists, masked dances, and mythological characters. A highlight at this festival is the Bhairavi kolam, an arrangement made from 1001 painted areca nut fronds. Where: Sree Puthukulangara Devi Temple, Othara, Pathanamthitta district, Kerala. The Braj Holi festival is dedicated to Lord Krishna, the eighth incarnation of Lord Vishnu, who is believed to have spent much of his childhood in the Braj region of Rajasthan. It celebrates the love between Radha and Krishna. A highlight is the performance of the traditional Raslila dance, which brings to life their love story. People also dress up as Radha and Krishna, sing and dance, and throw color on each other. In addition, Rajasthan Tourism facilitates fun activities such as nature walks, photography exhibitions, traditional rural sports, turban tying, and Bollywood music concerts. Where: Bharatpur, Deeg and Kaman in Rajasthan. Yet another Kerala temple festival, the Arattupuzha Pooram is a particularly large elephant pageant featuring around 60 elephants bearing brightly colored silk parasols. It's one of the oldest temple festivals in Kerala. Legend has it that on the day of the festival, 101 gods and goddesses from the neighboring villages visited Sree Ayyappan, the presiding deity of the Arattupuzha Temple. Where: Arattupuzha Temple, in the Thrissur district of Kerala. On the eve of Holi, people light bonfires to mark the occasion and ward of evil spirits in a ritual called Holika Dahan. For an unforgettable regal experience, join in the celebration of the Mewar royal family. There will be a magnificent palace procession from the royal residence to Manek Chowk, including bedecked horses and a royal band. Later, the traditional sacred fire will be lit and an effigy of Holika burnt. Holi is commonly referred to as the "Festival of Colors." People exuberantly throw colored powder and water all over each other, have parties, and dance under water sprinklers. Bhang (a paste made from cannabis plants) is also traditionally consumed during the celebrations. Holi is a very carefree festival that's great fun to participate in if you don’t mind getting wet and dirty. Find out the best ways and places to celebrate Holi in India. Where: All over India, particularly in the north. Celebrations in the south have a more religious focus. Goa's biggest spring festival, Shigmo, is the state's version of Holi. It's a Hindu festival that's filled with bright decorations, parades, singing, dancing, and colors. One traditional dance that's often performed is the Ghode Modni martial arts horse dance. When: For two weeks concluding on March 21, 2019. Where: All over Goa. Street parades start in Ponda and follow to other towns. They feature floats depicting Ramayana and Mahabharata scenes, drums, and folk dancing. Cultural programs are also held in Panjim. Celebrations are more authentic in rural areas. Expect plenty of authentic Goan cuisine and feni (the local alcoholic drink). If you're interested in a traditional tribal festival off the beaten track, don't miss the Myoko festival of the Apatani Tribe. It includes rituals for prosperity, fertility, purification and sacrifice performed by the village shaman or priest, and many interesting cultural elements such as folk performances and processions. When: March 20-30, 2019. The most interesting days for visitors are the second, third, and fourth days. At this temple festival, decorated structures are carried in procession accompanied by a traditional orchestra of drums. Some of the structures are 70 feet and 80 feet tall. They're competitively made by people of the surrounding villages. The structures are either carried on people's shoulders or taken out on chariots. Where: Poruvazhi Malanada temple, Adoor, Pathanamthitta district, Kerala. For an unusual tribal experience, head to the Kavant Fair. This rural harvest festival is a gathering of the Rathva tribe, who dress up as gods and demons from Hindu mythology and dance wildly to the beat of drunken drumming to celebrate the joy of life. The festival takes place a few days after Holi each year. Rural Pleasure conducts a guided tour to the fair from Vadodara. Where: Kavant village, near Chhota Udepur about two hours east of Vadodara. The 10-day Thirunakkara Arattu is another of Kerala's famous temple festivals. As is the norm with these festivals, the highlight on the last day is a procession of decorated elephants. Accompanied by drummers and other performers, they carry the temple god to be bathed. Other attractions of the festival are traditional Kathakali dancers, which perform throughout the night on the third and fourth days of the festival, and folk arts such as the Mayilattom (peacock dance) in the temple compound. Where: Thirunakkara Mahadeva Temple, Kottayam district, Kerala. Organized by Rajasthan Tourism to celebrate the state's foundation day, this festival is packed with cultural events for all age groups from morning until night. This includes chanting, folk dance, musical performances, film screenings, and fashion shows. Where: Various venues in Jaipur, Rajasthan. See newly hatched, endangered Olive Ridley turtles take their amazing march into the sea at the annual Turtle Festival. As well as this, you'll get to sample traditional Indian village life by stopping over at local homestays in the area (dormitory rooms only). When: From early March (refer to the website for the best times and dates, as it depends on nesting). Where: Velas village, Ratnagiri, Maharashtra.